Opposition objects to new rules on Area C.
Environmentalists cheered this week when Milan’s governing council announced another turn of the screw limiting vehicle access to the city centre, but opposition councillors are up in arms. Mayor Giuseppe Sala’s plan, presented on Monday, aims to reduce the number of vehicles circulating and parking in the historic centre, and generally to “fluidify” the circulation of all road traffic around the centre. A long list of new rules, to come into effect on 15 February, includes limiting to 40 the number of times residents with Euro 3 emissions class diesel vehicles may enter the Area C zone free, after which they will have to pay a fee, while Euro 4 diesels will be completely banned. 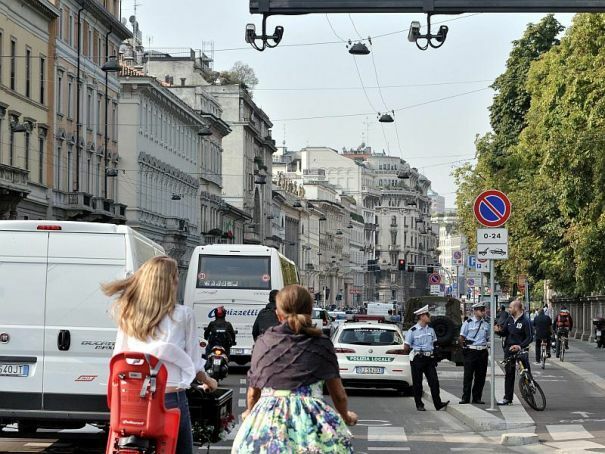 Also, reviving a suggestion by previous mayor Pisapia, even vehicles powered by LPG and methane – exempt from limitations in most cities – will no longer enjoy free entry to the city centre, leaving only hybrid and electric-powered vehicles unchecked entry. A further limitation will be for delivery trucks, which will be barred from 08.00 to 10.00, and for tourist coaches, to be charged €200 for Euro 4 or €100 for Euro 5 engines. The new rules should lead to a drop of around 7,000 entries per day, explained city hall, or roughly the same positive effect on congestion caused by the summer school holidays. Freight transport companies cried out that this was merely “cosmetic environmentalism” and “an unbearable penalisation” of productive categories, and they were backed up by opposition councillors. Some pointed out that the new rules would intensify traffic in the surrounding streets, particularly in those where construction sites for the new metro line M4 are already creating traffic jams. Others demanded a sliding congestion charge calculated on the emissions category of vehicles, and the continued exemption for LPG and methane power. The plan promises lively debate in the council chamber, and the possibility of some adjustment, before it is ratified and put into practice.